SQA Advanced Diplomas provide skills and knowledge that meet the needs of employers. They are designed to equip learners with the knowledge needed for employment, or to progress to further academic or professional qualifications. The SQA Advanced Diploma in Golf Management (SCQF level 8) builds on the knowledge and skills developed within either the SQA Advanced Certificate in Golf Course Management (SCQF level 7) or the SQA Advanced Certificate in Golf Club Management (SCQF level 7) and covers the golf industry and tourism, managing turf, playing performance, and project management. This SQA Advanced Diploma provides progression routes to further study (see Progression). 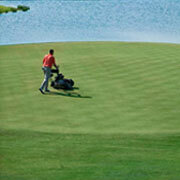 an SQA Advanced Certificate in Golf Course Management, Golf Club Management or Golf Management. Learners who achieve the SQA Advanced Diploma in Golf Management can progress to a related degree level course. For further information please refer to SQA’s progression partners. The SQA Advanced Diploma provides learners with a wide range of employment opportunities. With appropriate experience, the SQA Advanced Diploma could lead to Head Greenkeeper positions.